These deep-water corals live in the cold waters of the Bering Sea north of the Aleutian Islands. Stretching up to a strait across which Alaskans actually can see Russia, the Bering Sea holds riches that could prove as complicated as those above the Arctic Circle, where Russia, Dutch Shell, and others are staking claims for oil exploration. It’s fish in this instance, however, and a study by Dr. Robert Miller, a biologist with UCSB’s Marine Science Institute, and conducted with NOAA and Greenpeace has found that the Bering Sea’s Pribilof Canyon holds an unexpected bounty of corals and sponges that form a habitat for much of the fish and crustaceans that feed the northern reaches. The sea is also a rich fishing grounds for trawlers, which scoop up indiscriminately whatever lies along the bottom, potentially harming the ocean nurseries on which they depend. The study looked at five of the largest underwater canyons north of the Aleutian Islands, where the continental shelf jutting out from Alaska slopes in a “green belt” down to deeper waters and support species of rockfish like the Pacific ocean perch, flatfish such as flounder and sole, skates, and sculpins. Scientists used bycatch records, surveys, submersible expeditions, and statistics like temperature and current speed to find the best coral and sponge habitats. They discovered that Pribilof Canyon, which is larger than the Grand Canyon, contained more than 50 percent of the densest coral habitat and 45 percent of sponges. 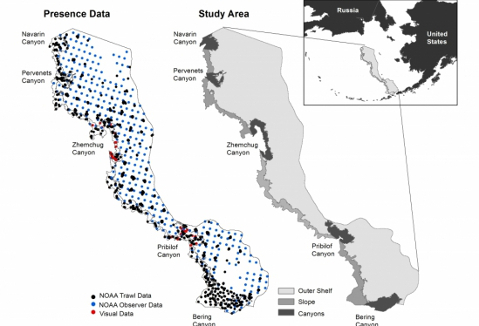 Since the canyon makes up less than 2 percent of the trawler grounds, a conservation area would not be likely to adversely affect commercial fishing. 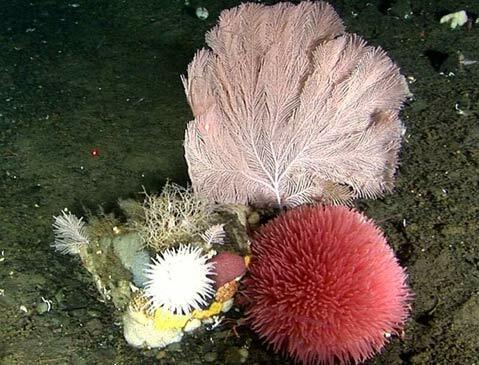 The North Pacific fisheries management council, which includes fishing industry representatives, will be meeting in October to discuss possible conservation measures in the canyons. The underwater canyon study encompassed much of the continental slope of the eastern Bering Sea, which extends over 600 miles.